This article highlights all my favorite vegan products, recipes, and resources that I've been obsessed with this past year. Please note: there many more products that I absolutely love, but I've narrowed it down to one or two per category so you'll know what I consider my must-tries. You can also check out my video about these products! 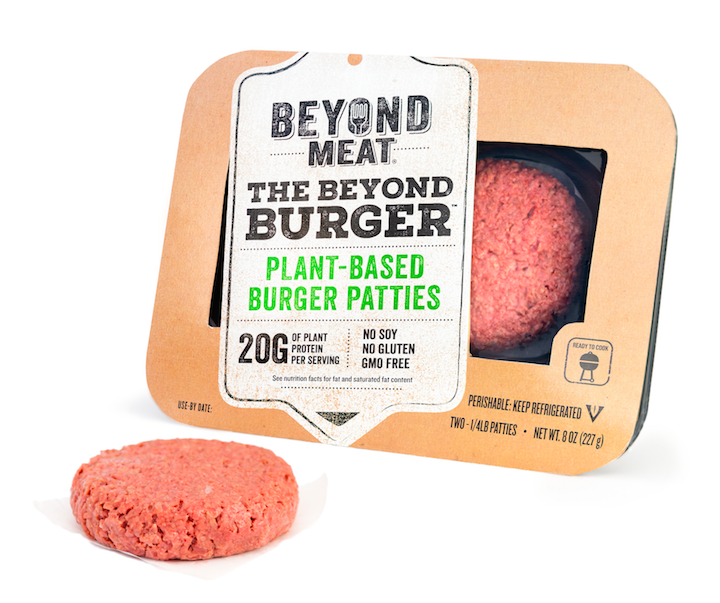 As a former lover of cheeseburgers, I can attest to the Beyond Burger's awesomeness. It's also omnivore-approved (my mom and sis love it). It tastes remarkably similar to the real thing, although there are slight textural differences, and most stores stock it right alongside real beef burgers. It's a little pricey and not as healthy as other options, but if you're missing that real burger experience, this is your best bet. You can also use it in meatballs, meatloaf, tacos, and any other recipes that traditionally call for ground beef. I also prefer it to the Impossible Burger, which was also designed to be hyperrealistic. These are the faux meats I've repurchased most over the course of 2017. Both are available in the frozen section of most grocery stores, and I buy either depending on which happens to be on sale. I prefer the texture of the Beyond Meat, but both are fairly convincing chicken substitutes (although not 100%). Both have great macros (high in protein, low in fat) and are great in stir-fries, fajitas, or salads. The Gardein strips also come with a packet of teriyaki sauce, but I rarely use it. The Beyond Meat strips are available lightly-seasoned, grilled, or southwestern style. 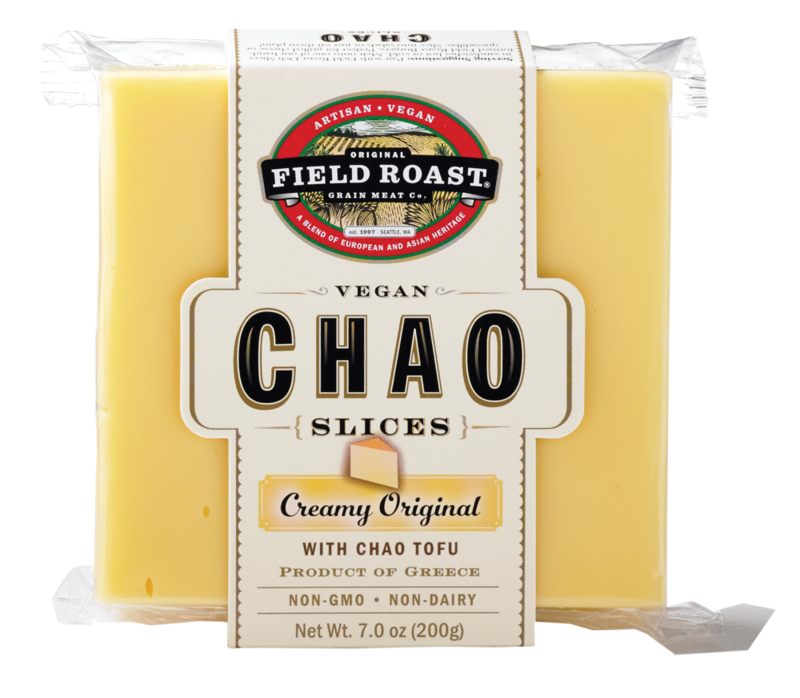 This has been my favorite vegan cheese for over a year! It's the only cheese I can enjoy without melting it first; it can be eaten cold on crackers and I've even nibbled on a slice on its own (no, I'm not proud of it). The coconut flavor is detectable but not overwhelming, especially if you put it in a sandwich or on a pizza with other robust flavors. The Creamy Original flavor is mild and somewhat reminiscent of provolone. The other flavors are also great – the Tomato Cayenne reminds me of pepper jack. I was a Kraft Singles addict as a child – this is no exaggeration. This cheese tastes exactly the same as "the real thing" when melted into grilled cheeses or paninis, but I actually like the texture better! It's a little more firm. For the better part of the year, I stuck to Daiya cheddar and Trader Joe's vegan mozzarella for my shredded cheese needs. In November I tried the So Delicious shreds and they have become a fast favorite. They don't taste or melt 100% like real dairy cheese, but they are slightly more convincing than Daiya – a little less artificial in flavor. 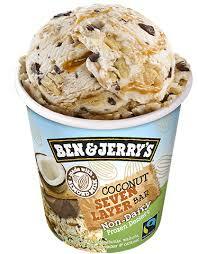 Allow me a moment to express my deepest and most heartfelt gratitude for Ben and Jerry. I feel as if their first 4 nondairy flavors raised the bar for everyone else, and now there are so many amazing nondairy options available. It was hard to choose my favorite B&J's flavor (it was a close tie between this one, the Caramel Almond Brittle, and the Coffee Caramel Fudge), but the Coconut Seven Layer Bar has all my favorite things: coconut, chocolate, nuts, caramel and graham crackers. The nondairy flavors are now widely available at "normal" supermarkets and Target stores, which is a huge plus. This year Haagen-Dazs released 4 nondairy ice cream flavors (Target-exclusive at the time of this writing), and all four are fantastic. They're completely indistinguishable from dairy ice cream, in my opinion. They aren't the most natural option (they're primarily made of oil, sugar and thickeners), but for an occasional treat I don't mind. I almost always have a carton of this in my fridge to cook with; personally I find almond milk too thin, and think it takes on a strange flavor when heated. This soy milk has a nice creamy texture and neutral flavor – it doesn't taste "beany" like some other soy milks. There are lots of nondairy creamers on the market these days, but this no-frills variety by Trader Joe's is my favorite. It has a nice creamy mouthfeel and doesn't separate in hot coffee. It's only very lightly sweetened, so I can add a good amount to my coffee or tea without making it sickeningly sweet. You can also add a splash to savory items such as pasta sauce or curry to make them creamier. I love this stuff so much that it's kind of a problem. This tastes indistinguishable from real butter to me in most contexts, unlike Earth Balance, which has a strong artificial flavor. It's so delicious that I use it not only in my cooking, but also as a spread for my bagels and English muffins. If you're a former bread-and-butter lover, ditch the other options and buy this stuff. Another plus: it's palm oil free! The only con I can think of: it's pricier than Earth Balance and less widely available. I buy mine at Trader Joe's. Whole Foods also carries it and other Miyoko's Kitchen products. As a lifelong mayo fanatic, I can confidently attest that this stuff tastes like the real thing. It's available at most supermarkets now, in addition to Whole Foods and Sprouts, and if you purchase at Wal-Mart it's substantially cheaper for some reason. Hampton Creek also offers a wide array of flavors (chipotle, sriracha, garlic), all of which taste great. I personally have yet to find a vegan cream cheese that is 100% accurate (I used to be that girl who would slather 1/2" of cream cheese on her bagel). However, my favorite option is the Kite Hill Cream Cheeses. The texture is fantastic and it has a nice tang as it's a cultured product. What I love best is its honest ingredient list; it's made of almonds, unlike the Daiya and Tofutti cream cheese alternatives, which are highly artificial. This isn't to say I don't sometimes purchase and enjoy those other brands, but the Kite Hill is my top pick. I don't purchase vegan yogurt all too often. I used to love nonfat Greek yogurt and haven't found a plant-based alternative that is truly up to par (although the Kite Hill Greek-style yogurt comes close). However, for regular yogurt, there are plenty of great options: Silk soy and So Delicious coconut yogurt are solid options, but my personal favorite is Forager Project cashewgurt. The flavor and texture are spot-on, and I love the simplicity of the ingredients list. How they managed to make this dairy white cheddar taste so convincing is beyond me, but I'll take it! My mom, sister and I have gone through so many bags of Skinny Pop while watching chick flicks. It's addictive and doesn't taste like a lower-calorie option at all. It's available at most grocery stores. I usually buy it at Target. By far my most-eaten meal of 2017! Usually I will prepare two packets of tofu at a time using this method and Trader Joe's Soyaki sauce. I'll cook a few cups of rice and have enough food prepped for a few days that week. Typically I'll buy frozen broccoli or green beans so that I can microwave or steam individual portions – I'm not a huge fan of reheated greens, so I rarely precook them while meal prepping. This recipe will always have a special place in my heart, because my video review of these carrot lox went semi-viral in January and totally changed the YouTube game for me. Following that lucky break, I've spent the past year turning YouTube and blogging into my full-time job, and I couldn't be more grateful. All that aside, this is also a fantastic, must-try recipe for anyone who once loved bagels and smoked salmon. If I were throwing a brunch party, I would absolutely set up a station with bagel fixings, including fresh sliced cucumber, tomato and red onion, homemade cultured cashew cream cheese and a big batch of these lox. I did a video review of this recipe a few months ago and enjoyed it so much that I ate it all within two days! Enough said, right? I have a more detailed blog post about this recipe here, but I highly recommend for anyone who loves creamy pasta dishes. I love kombucha and this is my go-to brand. They have an insane flavor selection (my favorites are the Trilogy and Guava Goddess) and they're widely available, not only at health food stores but also at Safeways and the like. These drinks are the nectar of the gods! My sister likens the texture of these to that of "melted ice cream," because they're so supremely creamy. They're not excessively coconutty as some coconut cream-based products are, and they're perfectly sweetened with coconut sugar and stevia. The Maca Mocha is actually coffee-free; its robust flavor comes from chicory and carob. The Maca Cold Brew is brewed from fair trade beans. They also offer an Ashwaganda Chai and Matcha Latte which are good, but these three flavors are my favorites by far. They're a little pricey, but as an occasional treat I think totally work it. This is one of the few protein powders that digests well for me. It's entirely raw and each scoop nets 22g protein, 4g BCAAs and only 2g carbs. It's a little pricey, but I grab a few tubs every time it goes on sale on Sprouts. My favorite flavor is chocolate, but the vanilla and vanilla spiced chai taste great as well. This raw protein is derived from yellow peas and hemp seeds. It contains 22g protein, 6g BCAAs, and zero artificial sweeteners or preservatives. It also contains digestive enzymes, so it's a great option if protein powder typically bloats you. As a salted caramel fanatic, I love the flavor and texture of this powder, but they also offer a raw cacao, vanilla, and blueberry acai flavor. Vivo Life is an up-and-coming UK-based brand whose roster of ambassadors includes YouTubers Derek Simnett and Jon Venus, among other awesome vegan athletes. This book is a must-have for any vegan home cook wanting to make homemade staples such as butter, cheese, plant milk and seitan. There are also a number of innovative recipes for plant-based versions of originally non-vegan foods like ribs, easy mac and cheese, and omelettes. Miyoko's recipes are sure to inspire you to be more creative in the kitchen. I rarely use recipes (I'm more of an experimental cook) but I'll often browse her blog for foodspiration. Her photography is perfection! I've loosely followed several of her recipes this year and my favorites are her tofu quiche, eggplant queso, and BBQ jackfruit. She also has a cookbook! I don't watch much YouTube these days, since I usually don't have much free time and prefer not to be too influenced by other people's content, but Avant Garde Vegan (hosted by Gaz Oakley) is one of the few channels whose videos I watch religiously. It's a professionally-produced series and each episode is a work of art; it's essentially a Food Network show for YouTube! The recipes are creative and artfully made, and Gaz has such a gentle and pleasant energy. I'm absolutely planning to purchase his upcoming cookbook and review a few recipes for Sarah's Vegan Kitchen. I've enjoyed so many amazing vegan meals in restaurants this past year. It was hard to narrow down my favorite, but I've chosen Plant Power Fast Food in San Diego. As their name suggests, they offer vegan versions of fast food classics, boasting an extensive burger menu, corn dog bites, chicken tenders, fries, milkshakes and root beer floats, to name just a few options. I've eaten there 4 times, and my favorite item by far is their Bic Zac: a plant-based recreation of the McDonald's Big Mac, but better! They also offer a chicken and waffle sandwich, a breakfast burrito and a sausage muffin with tofu "egg" on their breakfast menu. Everything I've had there has been phenomenal! It's also pretty inexpensive, especially compared to many other vegan restaurants in San Diego.